An innovative way to honor the bravery and dedication of those that protect and serve is springing up in the form of law enforcement challenge coins. Such police challenge coins are given as tokens of appreciation and to identify the members of a certain unit, as well as boost morale. They can vary widely in diameter and thickness, and are custom made per your department’s specs. A typical pocket coin usually measures 38 mm by 3.0 mm, while a presentation coin or honorary medallion is normally 45 mm by 3.5 mm or more. Police challenge coins can be minted in all shapes and sizes, from square or oval to coins resembling dog tags. Even badge shaped coins are possible! The coin finishes include silver, gold, nickel, bronze or an antique finish. Colored enamel fills or a printed inset with an epoxy coating can add color and depth. The popularity of law enforcement challenge coins has increased to the point where some major municipal agencies have begun their own challenge coin program. In the Mint Hill, N.C. Police Department, an officer who has done a good deed and received two letters of recommendation receives a challenge coin. They are also used by the Utah Highway Patrol, the Duluth, MN Police Department, the Hartford County MD Sheriff’s Office, the Florida Police Chiefs Association, the Colorado State Patrol, the Metropolitan Police of Nashville, and other law enforcement agencies. Supporters point to a number of reasons why police challenge coins are popular among many organizations. They can be great advertising/PR pieces for the organization, as well as a unique way to show appreciation. They celebrate an anniversary or commemorate a milestone. Additionally, they have collector’s item appeal, and they are a good source of inspiration. Police challenge coins are also a way to give back to the law enforcement community for the sacrifices they make every day. One example is the Laredo, TX, Police Department, which ordered custom police challenge coins to accompany a memorial for a fallen officer. Challenge coins are even presented to officers-in-training, and used to strengthen partnerships between police and the charities they support. The Indiana Law Enforcement Training Academy regularly purchases law enforcement challenge coins for the cadets at the academy, as a “rite of passage” at graduation. In 2010, a custom coin was created for the North Carolina Law Enforcement Torch Run for Special Olympics. The run united officers from law enforcement agencies and corrections departments across the state in an effort to raise funds and awareness for the Special Olympics of North Carolina. The coin served as a memento which participants, fans, and those who made donations could have to remember the event. Challenge Coins – A Useful Police Fundraiser Tool. In June 2011, the Howard, WI Fire Department announced it received 100 police challenge coins bearing the department’s symbol. Proceeds from the sales of the coins benefited the Howard Fire Department Auxiliary to purchase and maintain gear and uniforms. When the Oregon Department of Corrections sold the law enforcement challenge coins as part of a fundraising effort, the proceeds went to an organization called Homes for Our Troops, a national nonprofit founded in 2004 to help soldiers wounded since Sept. 11, 2001. Another effort to commemorate first responders heroism in the wake of 9/11 began with a Sept. 2011 campaign to raise thousands for organizations including the New York Police Department and the Seattle Police Department. The next time a colleague or business associate brings up the idea of starting up a company Challenge Coin Program, remember the concept behind it and what it represents. Buying such a coin is a good way to show support for firefighters, law enforcement officers and other public servants who risk their lives daily for others. Owning one gives a sense of pride and belonging, and proudly displaying it is a constant reminder of significant events. One of the best things about our police challenge coins is that they are fully customizable and one-of-a-kind, which adds to their “collectible” status and also makes them more meaningful. 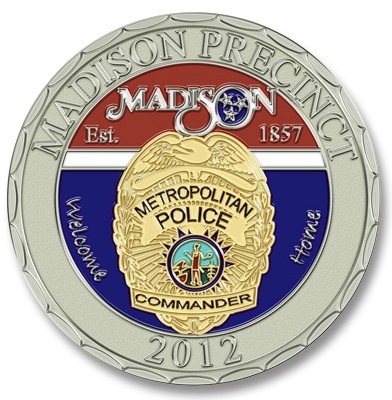 Most law enforcement units order coins which are inscribed with the name of their police department and their insignia. Even more customization options are available depending on your needs. If for example you want to order coins in bulk to use for many different events, you might want to stop at that level of customization, since a coin with your department name and insignia will be perfect for any occasion. If however you are in need of a coin for a special event or you wish to recognize or commemorate an individual, you might want to include more text on your coin. What are some examples of police challenge coins you might order for special events? Perhaps a particular unit in your department has achieved a significant milestone law enforcement. What better way to recognize the excellent work of your team members than to gift each one with a special police coin? You may can include the name of your police department and the name of that unit, for example “Special Operations” or “High Risk Entry Team.” The gift of these special coins will further cultivate unity and cohesion among the ranks. Maybe a particular individual in your department stands out from the crowd. You can award that person with police challenge coins bearing his or her name and position within the department. A custom coin or medallion demonstrates to your officer or civilian staff that you truly care enough to bestow a meaningful, personal reward of recognition. Coins are more momentous awards for service than certificates; they are more resilient and made of higher quality materials. Quite simply, they endure…just like their message. Our custom coins are beautifully designed out of a variety of metals and other options. The material you choose is up to you; we can also use either a soft or hard enamel process depending on your preferences. Our professional graphics department is capable of rendering finely detailed images onto even the smallest coins, complete with bold, bright colors — this is true with hard and soft enamel. Shiny metal has a beautiful luster, but the aged patina on antique metal can create stunning depth. 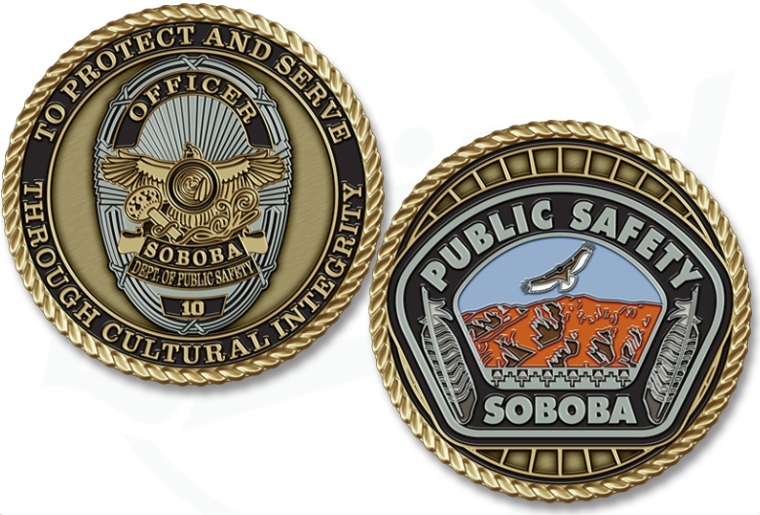 Adorn your police challenge coins with a variety of edge options made available for coins of all types. We have a basic flat cut edge if you’re after simplicity, but we also offer additional elegance in the form of rope cut, spur, oblique, bevel cut and diamond cross cut edges. Each edge cut makes a different statement, like each material. All of our options – for edges, patinas, enamel finishes, and materials – convey a message of prestige and recognition. How you present your police coins can be as important as the coins themselves. We include clear PVC envelopes free with every order so that you always have a basic presentation option. This may be all you need if you are distributing a lot of police coins at a special event. If however you are selling them as collector’s items for a law enforcement fundraiser or awarding them to members of your police department, you probably want a more elegant option. A velvet coin pouch or box are pleasing to the eye and add an extra touch of ceremony. Plastic coin capsules and acrylic coin boxes are perfect display cases which are excellent for personal awards. We take pride in crafting law enforcement challenge coins which convey a sense of depth using techniques like three-dimensional molding, cut-outs, acrylic coatings, and dual plating. Traditional 2D designs are also available if you prefer a smooth surface. Texture and depth can increase the “presentability” of your police coins though and help them to catch the light and stand out in a display case. Glitter paint and glow-in-the-dark can add a little extra panache—glow in the dark paint could be particularly appropriate to reward an officer who does night rounds! Our law enforcement challenge coins come in any size or shape you can dream up, at affordable prices. Bulk rates are available to save you money on extremely large orders, and our graphics team is standing by to help you get started. Know exactly what you want? We’ll make it happen. Not sure where to begin? Our artwork portfolio has plenty of ideas to help fire up your imagination and spark some creativity. We’re also ready to work with you one on one to figure out the perfect custom design. Whatever your specific needs, we want to help you design the perfect unique challenge coin for your police department; one which will express your professionalism and appreciation with ceremony and dignity. Whether you’re ready to order your own police challenge coins, or you just have some questions to ask right now, you can reach us toll free at 1-800-818-3229. We look forward to discussing your needs in depth!